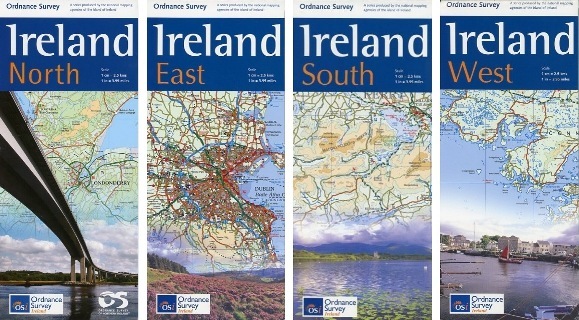 The Discovery map series, designed for a wide range of leisure activities, from the OSI, the Ordnance Survey of Ireland, presents the country on detailed topographic maps at 1:50,000, Graphics indicate different types of woodlands. An additional overprint highlights way marked or unmarked walking trails as well as cycle routes. National or forest parks and nature reserves are marked and a range of symbols provide tourist information: campsites, caravan parks, youth hostels, tourist offices, parking and picnic places, golf courses and viewpoints. Road network grades third class roads according to their widths and includes local tracks. Railways are shown with stations. Maps are GPS compatible. Map legend is in Irish and English. Where appropriate, place names are given in both languages. Four road maps at 1:250,000 covering both the Republic of Ireland and Northern Ireland, with detailed road classification, altitude coloring and tourist information, published by OSI, the Ordnance Survey of Ireland, with the northern sheet produced in cooperation with the Ordnance Survey of Northern Ireland. Topography of the island is shown by altitude coloring, with additional spot heights and names of mountain or hill ranges and other geographical features. Additional graphics show different types of woodlands. Road network shows six grades of roads; gradients for steep roads are indicated only in Northern Ireland. Railway lines are shown with stations. A range of symbols highlights camping and caravan sites, nature reserves, National Trust and An Taisce properties or land, golf courses (indicating the number of holes), historical sites, etc... The maps are GPS compatible. No index is provided.